The Peter Rabbit Stories by Beatrix Potter are as important to children as the works of author Johann Wolfgang von Goethe are to adults. And what better way to introduce Peter to your child than on Easter? 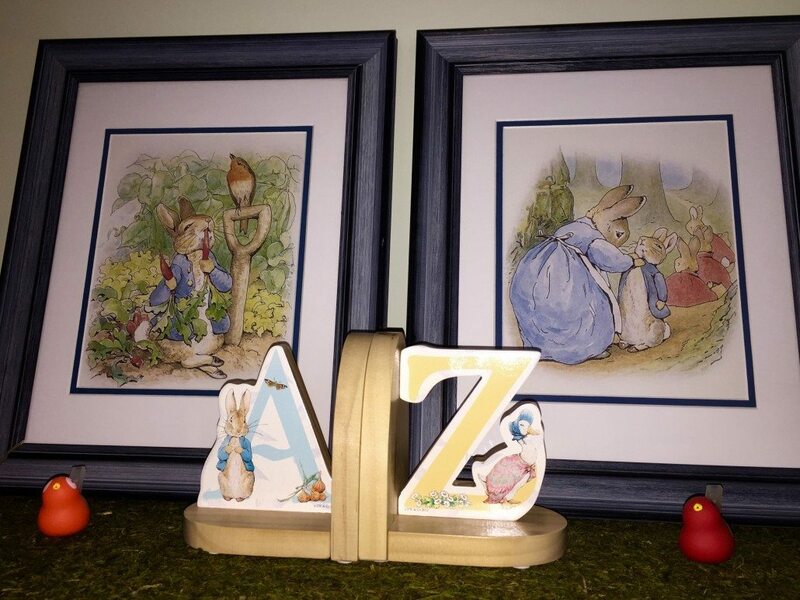 When I was expecting my last child, I decorated the nursery with the Peter Rabbit theme. When I was expecting my first grandchild, it was only natural that I would want to continue with the Peter Rabbit theme. That’s right, I have a room in my house dedicated to the cute little rabbit in a blue jacket. And my grandkids love it. Instead of or in addition to traditional Easter chocolates and candies, consider filling the Easter baskets with any of the following items available online. Just click on the linked titles. No child’s library is complete without Peter Rabbit Stories. 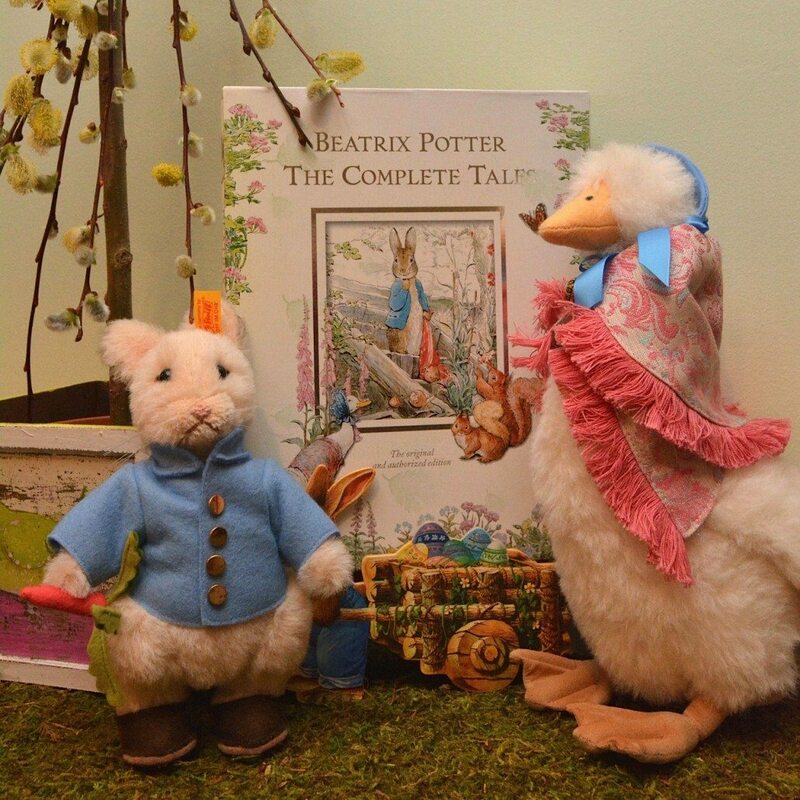 A heart-warming classic—beautifully written and illustrated book by Beatrix Potter. Add Peter Rabbit Tell a Tiny Tale and the children can create their own mini adventure or the Tale of Peter Rabbit A sound and story book. 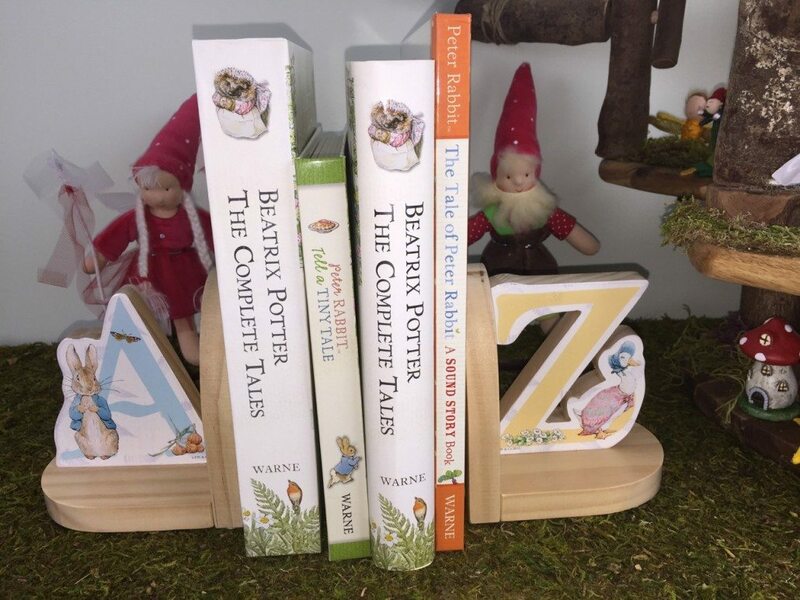 The Peter Rabbit bookends will keep the books in place. A Peter Rabbit puzzle for sure will keep your children busy. and enamelware dish set Peter Rabbit, Jemima Puddle Duck, Jeremy Fisher, and Peter Rabbit Watering Can. Promoting Constructive eating with the construction utensils or garden fairy utensils the children can’t wait to eat. I also found the porcelain tea set for the children to play with. Made by Reutter Porcelain of Germany, a beautiful 15-piece tea set featuring Peter Rabbit and friends. 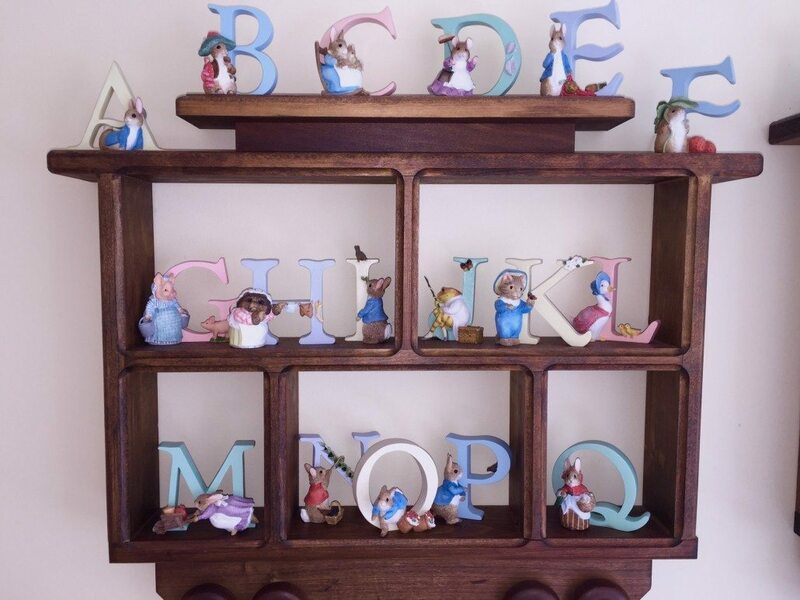 In addition to the bedding and curtains, I found wooden Peter Rabbit-themed letters. 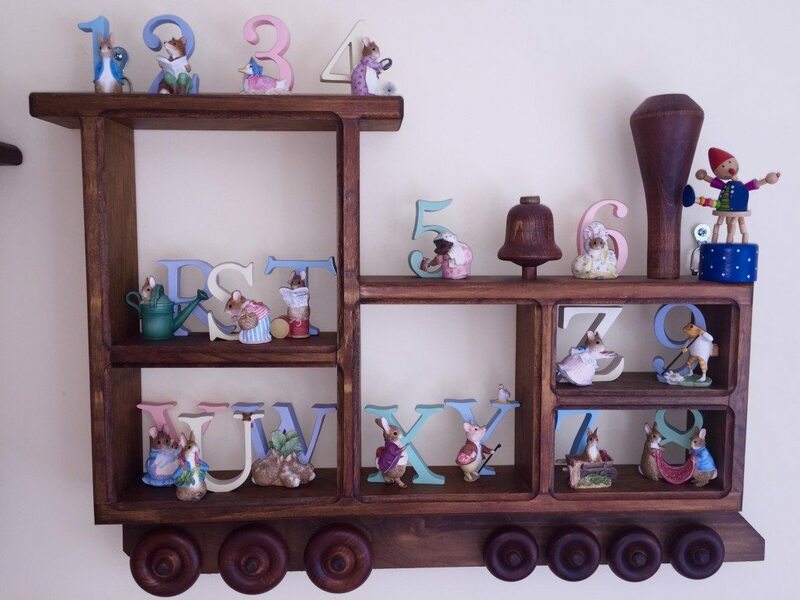 The “train” shelving came from a store that carries unfinished furniture. I stained it myself to save money, and in no time had the perfect wall decoration to showcase all the characters from the tale. Peter Rabbit and all his friends come to life in this beautifully detailed set. Collect them all or spell out your child’s name. Makes a great gift. Also, available here. Compare for the best price and shipping options.